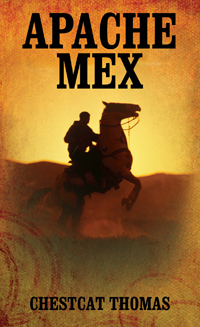 Take note from self-publishing Outskirts Press author, Chestcat Thomas, who is taking his latest book, Apache Mex, on tour – a virtual book tour, that is. He will be featured on several blogs over the weeks and months ahead so keep your eyes peeled to learn more about him and his book. Luckily for us, Chestcat was kind enough to answer a few questions as the tour was getting started so that we can give you a sneak peek into the mind of the creator of Apache Mex. OP: Tell us a little bit about Apache Mex. What is it about? CT: Because of my love for western story telling. CT: Those that love western story telling. CT: My book illustrates the ultimate love that one has for their mother where any prudent minded person would lawfully do anything within their power for their mother; in western story telling the gun is the decisive factor in justice being administered for most unjust situations. CT: No I have not published any other books, but I plan to do so in the very near future. OP: Thanks for your time, Chestcat! We look forward to learning more about you as you visit other bloggers! I’m a Native of Louisiana, who loves hunting, fishing, horseback riding, swimming in the Amite River, and Darlington Creek. My favorite childhood game was playing cowboys and indians, my favorite television shows were westerns, my favorite novels were westerns mostly written by Louis L’Amour. I love to write although it may be fiction, western fiction is a part of me. I grew up in a medium size family having one brother, and one sister, our father died when I was about one year old, therefore, I was only raised by my mother.